On Sunday, July 25th we had a San Diego Pop Warner Kicking Camp at La Jolla High School. The camp was open to all youth kickers and punters ages 10-13. On Sunday, July 25th we had a San Diego Pop Warner Kicking Camp at La Jolla High School. The camp was open to all youth kickers and punters ages 10-13. We had students come from all over Orange County, San Diego, Los Angeles, Temecula Valley and even Sacramento California! 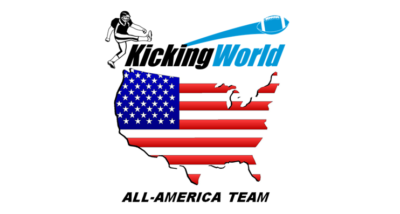 The youth kicking camp is designed for the beginner and intermediate pop warner kicker who is still learning the basic fundamentals in order to consistently kick extra points and even make field goals. We work on everything from extra points to field goals from the hash marks to kickoffs, onside kicks, and even some punting! As we do at every kicking camp, the focus is on kicking instruction with 1 on 1 coaching throughout the camp with high coach to student ratio. After all the camp students learn the techniques we give them a free kick period to practice what they’ve been taught. We also have a kicking competition for each facet of the kicking game: field goals, kickoffs and punting. All kicking camp students participate in the fun kicking competitions and have the opportunity to try to win awards. We give out all sorts of cool prizes like Wilson TDY footballs, Wizard football holders, kickoff tees, field goal blocks and more! In this year’s summer San Diego Pop Warner kicking camp we had some impressive kicking talent. Our most accurate kicker of the camp was Alec Dibell of Fullerton Pop Warner. Alec made 4 field goals in a row back to 30 yards allowing him to knock off the competition and win most accurate kicker overall and for his age group of 13 year olds. In the younger group, we had the 10, 11 and 12 year olds competing. There was a clear winner in this group as young Jake Haggard, only 10 years old of San Clemente Pop Warner was able to also make 4 field goals in a row back to 25 yards. We also had a longest field goal competition where each student got a chance to see how far they can kick! Andy Clyde, 13 of the Irvine Chargers Junior All-American Football League won the longest field goal of the camp with a 35 yard field goal! All 3 campers happen to be active Kicking World students! Great job boys! In the punting competition Cole Carpenter, 12 years old of Temecula Valley Pop Warner won the younger age group with a 35 yard Punt Average. Alec Dibble of Fountain Valley Pop Warner displayed some awesome punting skills winning the 13 year old group with a 46 yard Punt Average! Great job on those punts! By the time we got to kickoffs everyone’s legs were starting to die out. This is the case at most kicking camps- the last section tends to be the weakest. Even though the boys were tired they still were able to pull together some long kickoffs! Cole Carpenter of Temecula Valley Pop Warner won the younger group and Andy Clyde (Irvine Chargers JAAF) crushed the competition and won the overall and older age group kickoff competition with a 44.5 yard kickoff average! All in all the camp was a major success because we had plenty of kicking instruction 101 geared toward the beginner pop warner kicker and punter. By the end of the kicking camp it was obvious there was dramatic improvement from everyone. Some of the kickers were able to perfect their onside kicks and even hit the hard to master ‘pop-up onside kick’! One kicking camp student couldn’t make it over the goal posts kicking from the goal line, but by the end of the camp he was routinely kicking extra points! It was a fun day out on the field and it’s very rewarding working with the younger guys and witnessing their kicking improvement.